"The social network really does come on like a reflex. It is the brain's preferred state of being, one that it returns to literally the second it has a chance." Lieberman describes this preference for social thinking as something good, saying that our default social thinking primes us to be prepared for effective social thinking. When I read about this I remembered a post I wrote a few years ago: In praise of task focus. In that post I wrote about a book chapter by Michael Robinson and Maya Tamir called A Task-Focused Mind is a Happy and Productive Mind: A Processing Perspective. The authors compared two modes of processing: task-focused and self-focused. 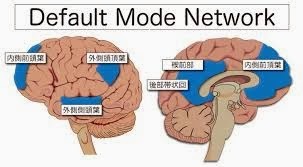 They say that because of the limitation of our attention, these two modes of processing inhibit each other; so either you are self-focused or you are task-focused. Based on research, the authors say that a task-focused mode of processing is generally more conducive to positive affect, mental health, and productivity while a self-focused processing mode leads to negative affect, psychopathology, and lesser task success. Question: I am a bit confused. To what extent do these two bits of research contradict each other? Lieberman's research suggests that non-task focused cognition is very useful for effective social thinking while Robinson and Tamir's chapter suggests that a task focus is important for mental health. Maybe both of them are right and non-task focused cognition has an inner and outer locus of attention. I'm no scientist but I can imagine that social interaction with the "what can I get?" focus could yield very different results than social interaction with the "what can I give?" focus (competition vs. cooperation). Hi Peter, Thanks. Interesting thoughts!